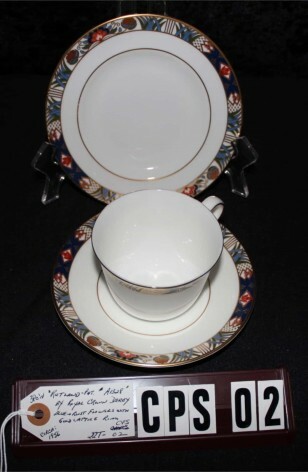 Vintage - Royal Crown Derby Fine Bone China Tea Trio Set, Rutland Pattern #A1228, Circa 1956-1958. A great Fine Bone China Tea Trio Set, by Royal Crown Derby, in the Rutland Pattern #A1328. This is a lovely White Bone China Decorated with Blue and Rust, with Rust Flowers, along with the 22kt Gold Lattice pattern in the Band, on the Lips of the Plates, and below Tea Cup Rim. Items have Inner & outer 22kt Gold Verge with 22kt Gold Trimmed Rim. This is an exquisite Cup, Saucer and Tea Plate. Great as Tea for One, or anyone's collection. In Good Resale Condition unless noted below or in pictures.